Eight hours a day in front of a computer screen isn’t the best for your health, or your waistline. Most of the Crush team are active individuals outside of work, as the frequent coffees and soft drinks that burden us geeks can quickly take its toll. If you followed our old blog you’ll know last year Grant and I took our exercise regime one step further and completed the 2009 Men’s Health Survival of the Fittest challenge. Hungry for more – and a sucker for punishment – I decided to take up the challenge once again; although a certain account director (who shall remain nameless) decided he wasn’t up to it at the last minute. So joined by my fiancé, my brother, and a few other adventurous friends, last weekend we headed out for the race. If you aren’t familiar with the event concept, it is a 10 k urban obstacle race around the historic city of Edinburgh. Starting on the cobbled streets of the Royal Mile, six waves of nearly 12,000 competitors battle it out through the closes and stairs of the High Street, working their way up to Calton Hill for an army assault course. From there, the route took a swift decent and a long slog through Arthurs Seat before negotiating the twists, turns, and yet more obstacles through Cowgate and the now derelict La Belle Angel venue. If you’re still in one piece by this point it is time for the killer…. 8 kilometres into the challenge, sweating, thirsty (and dying for the loo) we were faced with a massive inflatable obstacle course. As you can see in the video below, I was ready for a lie down at this point! After getting your breathe back it was time for the final dash through Grassmarket, round Princes St. Gardens and over the 20 ft wall to glory at the finish line. After much preparation and training, I managed to shave of one minute forty nine seconds from my time and completed the event in a respectable one hour and forty seconds. My friends were close behind, all completing in under an hour and fifteen minutes, which is an admirable time for their first event. All in all it was a great day, everyone loved it – and even those that had competed in other road races thought it was an exciting change of pace. Everyone in our group is all set to sign up for next year and better their times including myself with a goal of under an hour… third time lucky. 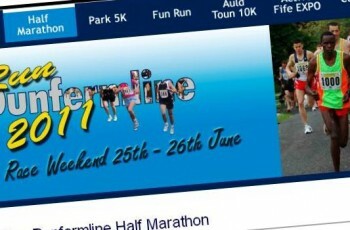 Four members of the Crush team have decided to get active and raise money for charity at Dunfermline’s Half Marathon in June.